Although Dracula 3: The Path of the Dragon is releasing only a few months after Frogware’s Dracula Origins, this Kheops developed and Encore/Microids published adventure is actually the latest in the series that came out for PC back in the early 2000’s. For those that have played quite a few adventure titles, it is likely that you will be familiar with these earlier entries, Dracula: The Last Sanctuary and Dracula: Resurrection. Path of the Dragon isn’t related character wise, but moves the mythos of Dracula forward in time setting the story in a post World War I Transylvania. And though this is definitely a niche type of game (even for the adventure genre), Kheops has once again done their research and provided a challenging and engaging experience. One thing that struck me about some of Kheops’ previous titles was how much research they had done, adding quite a few historical elements to their fiction. 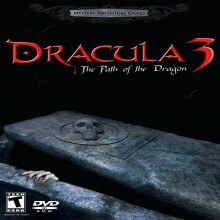 This is true of Dracula 3: The Path of the Dragon which bases its mythos on the elements Bram Stoker based his novel. Not only does the game tie into the story of Vlad Tepes (Vlad the Impaler, who the name of Dracula was first associated with), but it is possible to read all of Stoker’s novel in game if the player desires to do so. In addition to this, Kheops also adds a subplot revolving around the immediate effects of World War I on Transylvania and some of its neighboring European countries, but this is used more as a set up for a potential sequel set during World War II rather than as a means to move the game’s plot forward. But it is clear that the developers have done an extensive amount of research and have given players the means to read all sorts of historical data. However, while this game is obviously about Dracula, players don’t actually get to meet with him face to face until almost the end of the game. The title starts off with Father Arno Moriani traveling from the Vatican to the Transylvanian town of Vladoviste to determine if the town’s recently deceased doctor is a worthy candidate for sainthood or not. But upon arriving and beginning his investigation, it becomes clear that there is much more than the question of sainthood to be answered. Throughout the course of the game Father Moriani will travel to Budapest and Turkey as well as explore Vladoviste, and though the actual locations themselves are fairly limited there is a decent amount to see. It is worth mentioning that due to the slow, methodical nature of the investigation and the puzzles themselves, Dracula 3: The Path of the Dragon isn’t necessarily a scary game but does have elements of creepiness. The story is well told and has more twists and turns than one would expect, making it one worth experiencing. As players might expect, this game is controlled entirely via point and click and is in the first person view. The motion is fluid and load times are minimal, making it easy to maneuver around the world and look for clues. In addition to this, Kheops has made the inventory system incredibly easy to use by giving the player multiple pages on which to put certain items (making it easy to organize and find them when needed). Progress in the game is very slow paced and the puzzles can sometimes take a long time to figure out, so players who are impatient or who have not played too many adventure titles will find that this game is not for them. However, avid adventure gamers are probably wondering how the puzzles are as that is the element that will often make or break a game of this type. In this regard, Kheops delivers although the pacing is sometimes a bit uneven. Early on in the game players will have to perform medical procedures such as drawing blood and finding lock combinations, but by the time the game reaches its conclusion the puzzles ramp up significantly in difficulty and involve decoding messages using an Enigma machine. This is definitely a title with puzzles that could get players stuck for a long period of time without any help, but there is an immense feeling of satisfaction when you complete them. While the graphics in Dracula won’t be overly taxing on your computer’s graphics card, compared to recent titles in the genre it is one of the best looking. The characters and environments are very detailed and have a lot of personality to them, be it the pale looking orphaned boy or the creepy castle on the hill that once belonged to Vlad the Impaler. However, while Kheops definitely took the graphics engine they had in their previous games and took it one step further, there are some notable flaws. First, the impact that the environments and characters have on the player is dampened due to the fact that the game requires a lot of backtracking. The first time gamers meet certain characters and explore certain areas of Vladoviste they will be pulled in by the atmosphere, but after talking to the same 4-5 characters and exploring similar areas this effect is diminished. In addition to this, in the town it is always night time and at the castle it is always day time. This is likely due to the fact that everything is pre-rendered, but it does seem a bit strange for a priest to always be wandering around the town at night. As for the sound, the background music is played sparingly so that when it does become audible it enhances the creepiness of the areas the player is exploring. The voice acting it also well done, and while very few of the characters have voices that match their nationality the actors still manage to do a great job. Overall, the presentation is top notch and reinforces some of the historical aspects of this title. Kheops has once again done a wonderful job, and has made this latest edition in the Dracula series on par with its predecessors. And though there are some quirks with the lack of locations and the subplot that really doesn’t add that much to the game, players looking for a thought provoking and historically accurate adventure will really enjoy this title. This is certainly not a title to recommend to novices of the genre, but I can’t find a reason as to why those who are well versed in adventure games wouldn’t enjoy playing this one. Admittedly I am a little more excited for the potential of a Dracula game set during or slightly after World War II, but for now The Path of the Dragon is definitely a game worthy of the series name.